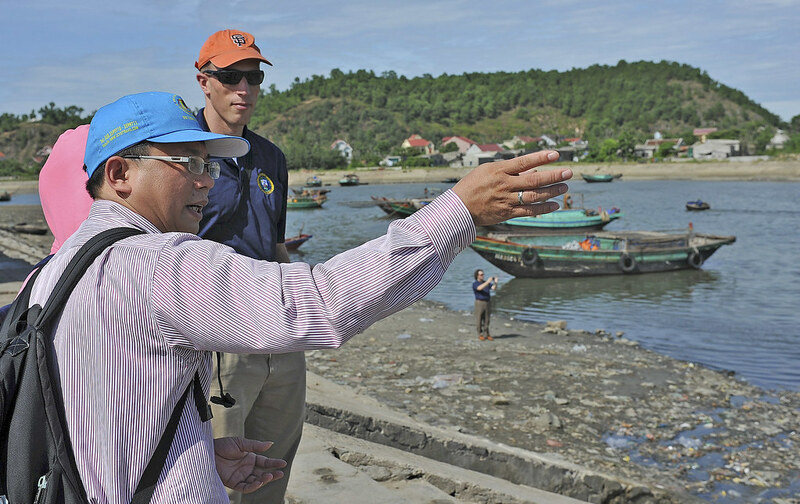 VINH, Vietnam - U.S. National Oceanic and Atmospheric Administration (NOAA) Fisheries Service experts are working with local Vietnamese fishermen during a three-day subject matter expert exchange (SMEE) July 16-20 during Pacific Partnership 2012 (PP12). The SMEE discussed pollution, the effects of tourism and various other factors that affect the fish population along the Nghe An province coastline. “The work that fishery folk do around the world isn’t work that makes front page news, but it is important work for the sustainability of fish,” said Michael Avvey, NOAA Fisheries Service representative. The SMEE also focused on identifying outside factors that may have been overlooked by fishermen. During the five-day SMEE, fishermen and volunteers from PP12 completed a classroom course followed by a site visit where students visited other fishermen and fish markets to experience firsthand some of the factors affecting the fish population. Avvey said combining the site visit with the classroom material creates a larger impact. The SMEE gave PP12 personnel, their host nation counterparts and experts an opportunity to learn from each other and foster an understanding of quality versus quantity with regards to the fish population off the coast of Vietnam. Now in its seventh year, Pacific Partnership 2012 is an annual U.S. Pacific Fleet humanitarian and civic assistance mission U.S. military, host and partner nations, non-governmental organizations and international agencies designed to build stronger relationships and disaster response capabilities in the Asia-Pacific region. For more information about the PP12 mission, please visit the Pacific Partnership Blog or engage with Pacific Partnership on Facebook and Twitter.